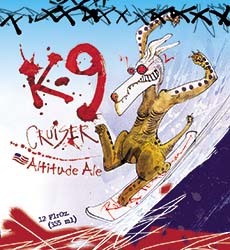 The K9 is Flying Dogs’ Winter Seasonal. It pours a deep red color with a fizzy, off-white head. Aromas are of fruity strawberries and malts. This is the first of the pack to smell of alcohol. Initial taste is smooth with a slight coal taste. Bitter by the finish. Oily on the mouth.